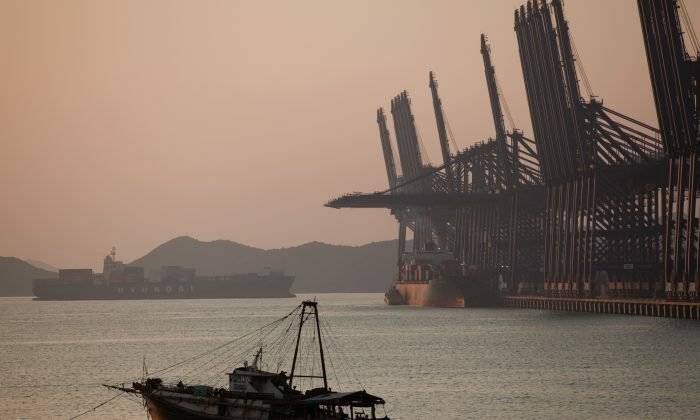 One of China’s business hubs is experiencing a rare decline in exports, amid an escalating trade spat with the United States. Shenzhen, located in the southern Chinese province of Guangdong, has one of the busiest container ports in the world. The city also is home to many factories that manufacture items for export. China’s customs agency ranked Shenzhen as the No. 1 city in export competitiveness last year, after evaluating its foreign trade and development capacities. So it is a sign of trouble when export numbers decline there. According to new data published by the municipal government, the value of the city’s exports fell 1.7 percent in the first half of this year, compared to the same period a year ago, to about 721 billion yuan ($105 billion). In addition, the trade surplus fell dramatically: 90.9 billion yuan in the first half, compared with 257 billion yuan in the first half of 2017. The threat of U.S. tariffs may be taking its toll on the export-heavy city. Throughout most of 2017, Shenzhen’s monthly export totals were on the upswing, topping almost 188 billion yuan in December. But by March 2018, exports fell to a low of about 113 billion yuan, before a slight increase to about 120 billion in April. Numbers fell again to 118 billion in May. Exports in Shenzhen make up a significant portion of the country’s overall exports. Shenzhen’s exports to the United States alone totaled $29.6 billion, according to official U.S. data. That’s more than 6 percent of the $462.6 billion total that China exports to the United States. The exports decline is reflective of the situation in the country overall, according to Liu Kaiming, president of the Shenzhen-based think tank Institute of Contemporary Observation. “Shenzhen is China’s biggest export base. … Just Shenzhen and Guangdong alone would make up about a third of the year’s total exports,” Liu told Radio Free Asia in an Aug. 6 interview. He predicted the downward trend would get worse in the latter half of the year as U.S. tariffs take effect, in addition to eventually forcing foreign investments to leave China. It should be noted that Shenzhen is home to a booming IT industry—including the headquarters of tech giant Tencent—which relies heavily on foreign imports, especially integrated circuits from the United States. Integrated circuits are a common component found in almost all electronic devices. In 2013, Shenzhen imported over $72.3 billion of integrated circuits, according to data from the U.S. Department of Commerce. While Beijing has aggressively pushed for Chinese firms to develop the country’s own domestic semiconductor industry and cut its reliance on foreign imports, innovation at home lags. A major part of U.S.–China trade tensions this year was the White House’s decision to punish Chinese telecom firm ZTE—after the company broke an agreement to discipline executives who conspired to evade U.S. sanctions on Iran and North Korea—by barring U.S. suppliers from selling tech parts to the company. The move essentially led ZTE to grind to a halt. In June, the United States reached a deal with China to lift the ban, in exchange for ZTE paying a $1.4 billion fine and making changes to its senior management.